Even the most experienced motorcyclists need a helmet to keep them safe on the roads. There are a lot of helmets made out of various materials out there, but today we are focusing on Carbon Fiber helmets. Did you know Carbon Fiber was originally developed by the Ministry of Defence to build strong, lightweight air crafts? Even today the airplane model Airbus A350 is more than half made up of Carbon Fiber. The material has also been used to make cars and is popular with civil engineers because it can help strengthen materials like steel, timber, and concrete. Our new update to this article features a number of new carbon fiber helmets, replacing some of the outdated ones that use to occupy their spots on our top ten list. We've also added a section showcasing the criteria we used to evaluate the helmets on our list. If it’s strong enough for a plane, it’s strong enough for your head. Carbon Fiber is one of the lightest and strongest motorcycle helmet materials out there, and it will give you the double advantage of a lightweight helmet that won’t slow you down and won’t compromise on safety. Carbon fiber helmets are the best choice for road-safety, with their ultra-protective, durable construction and shatter-proof capabilities. While plastic helmets end up being somewhat cheaper, they inevitably sacrifice safety in return for affordability. 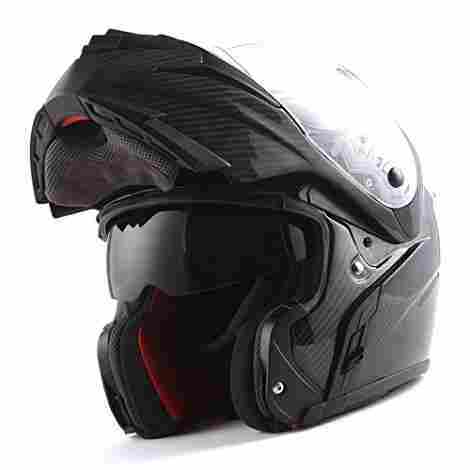 Carbon fiber helmets are the first choice for serious motorcyclists who want maximum protection on the roads. Every helmet we’ve included on this list has been safety approved to DOT and/or Snell standards. These are the standard safety qualifications that any serious motorcycle helmet have to attain. Helmets which haven’t been approved by these standards run the risk of not being fit for the road, so we’ve made your choice easier by only selecting fully compliant carbon fiber models. 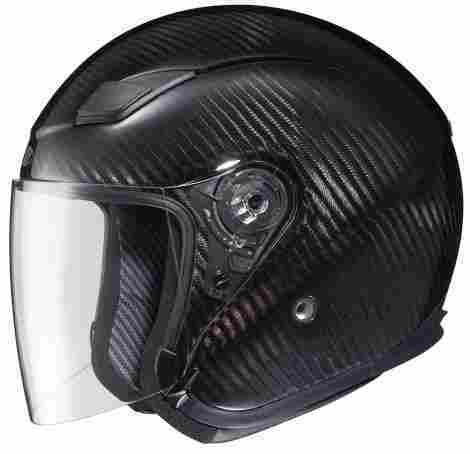 Carbon fiber helmets are a specific type of motorcycle helmet which uses a hand-layered carbon weave to create a surface that is stronger, more flexible, and more durable than ABS, thermoplastic or polycarbonate. 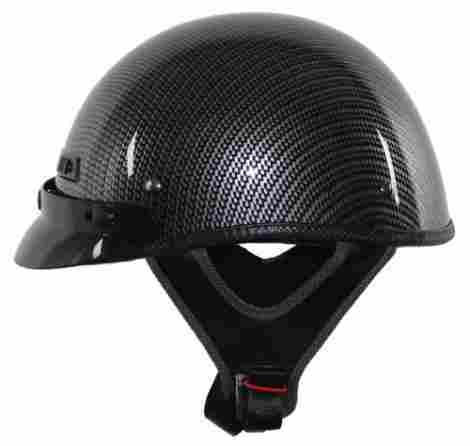 Carbon fiber helmets are shatterproof and provide the maximum possible crash-protection on the road. This review will break down the positive and negative features of the top 10 carbon fiber helmets currently on the market. So read on, and arm yourself with the knowledge you need to make the right choice. This stylish half-helmet from Voss is ideal for the casual cruiser, with its low-key, traditional style. With an integrated drop-down visor, quick release ratchets, and a microfiber lining, this helmet looks the part, while also providing solid carbon fiber protection. Fully DOT approved, and weighing in at only 1.9lbs, this helmet competes with models way above its price range. The lining of the helmet is made of antimicrobial, breathable microfiber which can be easily removed and washed individually. This adds years to the life of the helmet and makes it easier to share helmets without worrying about spreading germs. The visor can be removed completely, exchanged for other visors, or simply tucked up into the helmet, ready to be deployed when you need it. This model comes with a choice of visor tints, with choices of clear, amber, iridium and smoke lenses. This Voss helmet ticks a lot of boxes and offers strong competition to higher-priced models. 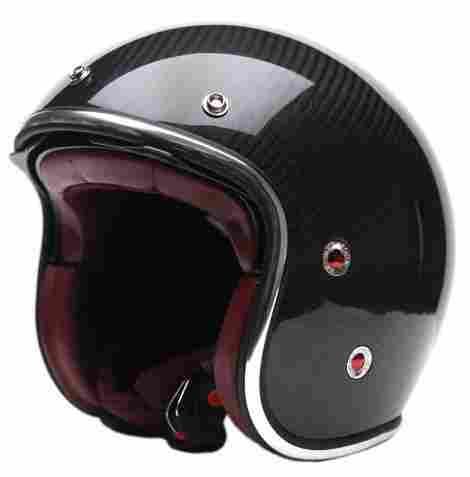 It has a range of features which make it a great choice for a summer half-helmet. Smart design means it can accommodate hats, scarves, and glasses for colder conditions. 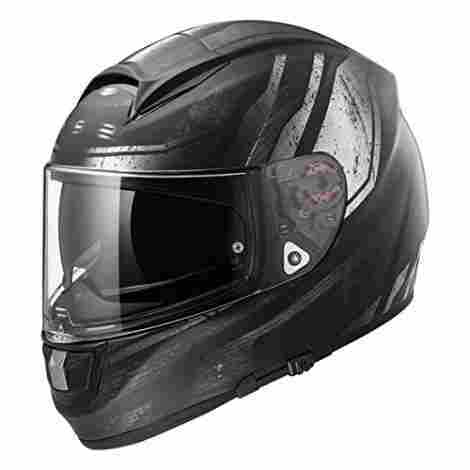 This full-face helmet from 1Storm comes with multiple ventilation channels, choice of clear or smoked visors, and an aerodynamic design with spoiler-effect air-shafts on the back. It has a heavily cushioned interior which can be removed for cleaning, and a built-in visor to keep the elements from disturbing you while driving. The HG335 is an ultra-protective full-face that doesn’t renege on style. With 5 ventilation shafts at various positions across the helmet, hot air from your breath can escape easily, while clean air can pass through efficiently. This makes it very hard for steaming to occur and stops condensation build-up. The cushioned lining makes for a snug fit, while still allowing enough room for an earpiece or small pair of glasses. 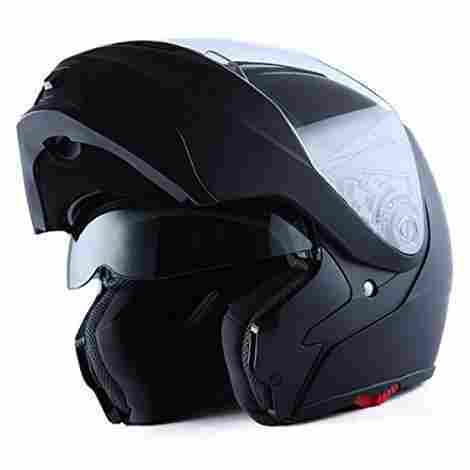 This helmet provides enough sealed protection from the wind while still being roomy enough to accommodate functionality. The 1Storm HG335 is a solid, fully carbon fiber helmet that represents great value for money. While other models command much higher prices, this helmet still manages to hold its own in a competitive market. This muscular looking helmet from AGV represents the premium end of the market and comes with a range of features which set it apart. Its aesthetic achieves a highly militarized look, and it comes with a horde of ventilation shafts, adjustable visor, and anti-fog shield. 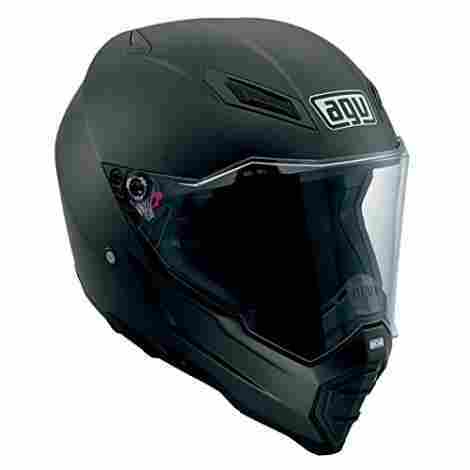 The AX-8 Evo is a bold helmet with a bold, eye-catching design that is sure to turn heads. A small feature like an adjustable visor makes all the difference when it comes to full-face helmets. You may think it’s not worth mentioning, but the extra functionality achieved by an adjustable visor could be the deciding factor for many. If unique style is what you’re after, then look no further. This helmet has a muscular, combat-style design, which isn’t merely a gimmick. The Evo has been designed with protection in mind, and also comes with anti-fogging features. The AX-8 Evo commands a higher price than most on this list. Its premium price can be justified with its range of features and lightweight carbon fiber construction. With a bold aesthetic style and breathable design, this helmet gives a lot of bang for its buck. This lightweight little Skullcap is slightly oval-shaped to avoid the ‘mushroom’ look that often comes with half-helmets. The shell is contoured to fit the shape of your head, while it also comes with an easy one-finger quick release strap, and moisture wicking interior materials for temperature regulation. This low-profile helmet exceeds DOT standards and makes for an excellent, lightweight road helmet. Many half-helmets leave the wearer looking like a mushroom head, but the Daytona Skullcap negates this effect by employing an oval-shaped design which contours to the head. This makes for a snug, aesthetically pleasing helmet that you can wear with pride. While many helmet manufacturers charge extra for a bigger size, the Daytona Skullcap comes with three different size options, all at the exact same price. This makes finding the right fit hassle-free, and won’t cost you more because of your head size. This model from Daytona presents fair value for what it delivers. With useful features like a one-finger release strap, moisture-wicking inner fabrics, and the choice of three sizes all at the same price, it justifies its half-helmet price. This protective full-face helmet from MARS comes fully equipped with a range of features which set it apart from many on this list. An adjustable front portion of the helmet can be flipped up to reveal an integrated visor underneath. With a double-layer of visor protection, full adjustability, and a protective full-face design, this model ticks several boxes at once. Also comes with multi-position ventilation shafts. The front portion of the helmet can be flipped up for easy functionality. Underneath the front-flip visor is a second, tinted visor which can function on its own, or can also be adjusted and tucked up into the helmet. With 5 ventilation channels positioned at three strategic positions on the helmet, wind can flow easily throughout. This also greatly reduces the possibility of steaming and fogging, since hot air doesn’t have a chance to linger for very long. Coming in at a mid-range price, this full-face modular helmet does everything you’d expect of a functional, premium, carbon fiber helmet. An integrated, tinted visor makes sunglasses unnecessary, and further increases this helmet’s functionality. This stylish open-face ¾ helmet features a slick red leather-effect, padded interior. It comes with an adjustable inner visor and a removable outer visor. A cool metal lining on the outside rim makes for a stylish look, while the metallic studded button effect adds style to the helmet’s functionality. A solid, low-key helmet with a simple yet efficient design. The front exterior visor can be removed completely for extra range of vision. It can be easily attached again using the sturdy buttons on the front of the helmet. This feature is uncommon and sets the YEMA 628 apart. After you’ve removed the outer visor you still have the use of the integrated inner visor. This can be adjusted and tucked up into the shell, or can likewise be removed if you so choose. Using both visors adds an extra layer of protection. Coming at a mid-range price on this list, this helmet from YEMA features several useful options while also achieving an eye-catching style. A reinforced chin-strap and double-ring D-buckle also stand out for this high-visibility ¾ helmet. This simple yet effective design from Joe Rocket makes for a cool, sleek helmet that doesn’t cry out for attention. If hi-tech styles and aesthetics aren’t your thing, this helmet presents a solid, effective option that does the job that’s asked of it. With an adjustable front visor and multiple ventilation chambers, this humble offering stakes a place for itself in a competitive market. The interior of the RKT is made from a breathable, removable, sublimated fabric which is designed to wick away heat and sweat and expel it from the helmet via the integrated ventilation system. This strategically designed network of ventilation shafts allows for optimal air circulation and allows excess heat and moisture to be wick out and away from the interior of the helmet. The Joe Rocket RKT slips into that mid-price-range and presents good value for money for what it delivers. A simple, effective helmet that doesn’t cry out for attention - it does the job that’s asked of it. 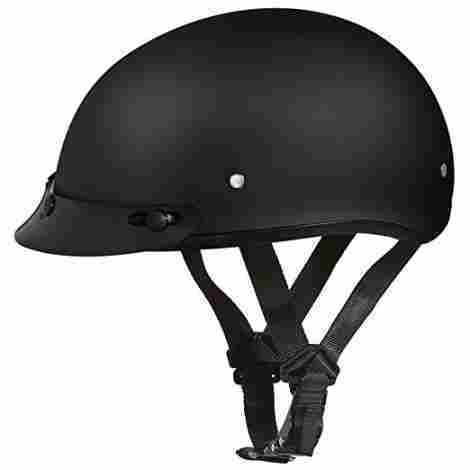 A stylish half-helmet with durable, adjustable chin-straps and exterior front visor, this model provides more than could probably be asked of it given its relatively low price. Available in a range of exclusive graphical styles, this DOT safety certified half-helmet also comes with a handy, free helmet bag for carrying your new gear. Front visor and vent are optional. Straight-forward, low-key design with customization options. The slightly oval-shaped design also cuts down on the dreaded ‘mushroom head’ effect. This will naturally suit some riders more than others. The abrupt cut-away styling of the helmet allows for a wide-range of vision, with enough room at the sides and front to allow for various motorcycle accessories. On top, the helmet fits snugly and tightly for good stability. Representing a more low-cost option than many on this list, the Vega XTS punches above its weight in many regards. A carbon fiber helmet, albeit a half-helmet, at this competitive price is pretty rare. The XTS provides excellent value for money. This multi-use, sporty model from LS2 presents a wide range of features and useful additions which make for an excellent full-face helmet. With a dual-visor set up which can be adjusted, this helmet can be used in a fairly wide range of environments and situations. The carbon fiber takes the pattern of an extra-wide weave, making this helmet stand out from other carbon fiber models. Although primarily an aesthetic feature, the extra wide weave of the carbon fiber apparently provides a more flexible shell without sacrificing any of its protective abilities. Achieves a unique visual style. The two visors on this helmet are easily adjustable and have been designed to be operated even with a heavily padded glove. Both visors can be flipped up - the inner visor tucks nicely into the front interior of the shell. The LS2 commands a higher price than most, but not all on this list. With a weight of 4lbs, it comes in lighter than several listed helmets, while not sacrificing the secure protection of its full-face design. This is a heavy, durable safety helmet with a bold, sporty design. It features 8 ventilation shafts with intake/exhaust capabilities, aided by aerodynamic channeling which runs across the entire surface of the helmet. The addition of an attachable cold-weather breath box means fogging will be avoided even on those frosty mornings that usually produce lots of condensation. The super-dense, interlocking foam of the interior adds extra crash protection. This plush, durable foam will absorb pressure in the event of a crash, adding another layer of protection to this already strong carbon fiber helmet. The intake/exhaust ports are designed with aerodynamics in mind and allow for maximum air-circulation throughout the helmet. Strategic positioning keeps wind distortion to a minimum while ensuring good ventilation. 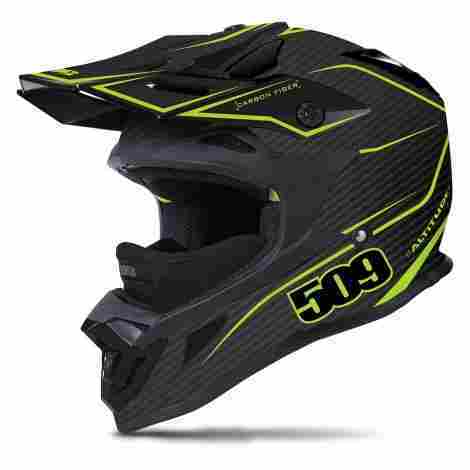 The relatively high price of the 509 Altitude may be out of reach of the casual buyer, but if you want an extremely durable, protective helmet, with an extensive range of premium features, this might just be the helmet for you. When buying a motorcycle helmet, including those that are carbon fiber, there are a few factors you need to consider. Here is a check list of some things to look out for before you buy. Whether the helmet is full face. Everyone’s preferences will be different, but a full face helmet will give you extra protection when on the road and help protect you against more injuries than other sized helmets. If the helmet you are buying is full face, you’ll need to make sure it has cushioned cheeks (or you’ll get uncomfortable very quickly) and you have to double check that is ventilated, otherwise aside from getting hot and uncomfortable the helmet will steam over and you won’t be able to see. Ventilation is important for other helmets as well because overheating is the last thing you’ll want when motorcycling on a hot day. Whether it is D.O.T certified. Helmets that are D.O.T certified fit certain safety requirements and you can rest assure that the helmet has been tested and came up to scratch. Avoid helmets that have not been certified, even if they are a very attractive price. Size. Most helmets come in four sizes: Small, Medium, Large and X-Large. Most of the products on this list come with the measurements for each size, so make sure to measure your head before buying to ensure you don’t end up with a helmet that’s too small or one that keeps falling off. Price. It is always worth paying a bit more initially for a good product that will last than wasting money on something cheap and flimsy that will keep breaking. The following guide will highlight some of the best carbon fiber motorcycle helmets on the market. Read on to find out more. Carbon Fiber helmets are, by nature, lightweight and strong, which gives you the best of both worlds and ensures you are comfortable and safe on the road. 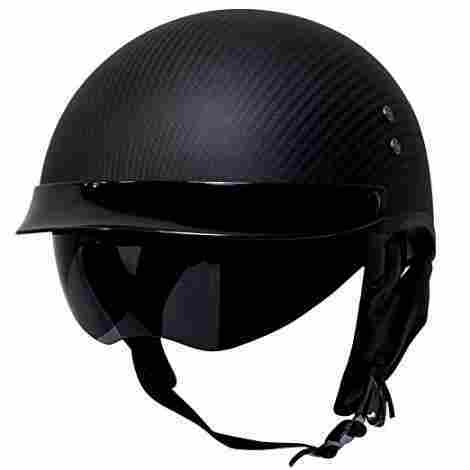 Carbon fiber is quite an attractive material, and the helmets listed above all have a sleek and polished look about them. Most of these helmets are aware that customers would like to avoid the ‘mushroom head’ effect where possible, and most of the helmets on this list have attempted to combat it and create a smaller design with a better fit. Carbon fiber is a very durable material that is trusted enough to be used on planes and cars, so if your helmet is made of genuine carbon fiber it should last longer and break less easily than other designs. Carbon fiber helmets tend to be (although not always) more expensive than their counterparts. As carbon fiber is a popular sportswear material, there are a lot of fakes and ‘carbon fiber like designs’ to watch out for. Remember that if it seems too cheap to be true, it probably is. Not all helmets come with removable padding, and if it is not specified it is safe to assume the padding is not removable. This is a problem because not only some people may want to do without the padding in certain situations but it is important to be able to clean the padding, especially if you are buying a full face helmet. Sizing can be an issue with all helmets, but as carbon fiber helmets tend to be smaller for a better fit it’s very important you measure your head before buying to avoid disappointment. Carbon fiber is sometimes also known as graphite fiber. It’s a lightweight material that offers some serious perks regarding your safety on the road. A lot of people, besides engineers and scientists, don’t really work with carbon fiber on a daily basis. We understand that it’s not exactly a household name quite yet. Regardless, you’d be surprised at how many products you already own that are made with a carbon fiber mixture! Q: Are carbon fiber helmets worth it? Absolutely! Having a carbon fiber helmet offers the peace of mind of knowing your mind isn’t going to end up in pieces. Riding motorcycles, or any other open-air vehicle, can be dangerous. You want a helmet that’s going to be up to the task of keeping you safe if the worst happens. They may be a little pricier than a run of the mill helmet, but they’re totally worth it. The material they’re made of is proven to be the best. When it comes to your safety you don’t want to settle for second best. Q: What makes carbon fiber helmets better? They’re stronger, more resilient, and more lightweight than any other helmet on the market. Carbon fiber is stronger than steel! Also, it happens to be twice as stiff. This makes it one of the best materials for personal safety gear. Even though it offers these features carbon fiber also manages to be lighter than steel, as well. These are all great attributes to have when you’re trying to create the best helmet out there. Q: How is carbon fiber made? We’re going to get a little technical here, so bear with me! What really sets these helmets apart is the arrangement of the atoms which make up the material. These atoms bond together in a unique way which creates an incredibly strong material. Essentially, carbon fiber is made up of tightly interlocked chains of carbon atoms. How the material is created is also important! There are only a few non-carbon atoms left after the technical process of creating carbon fiber. Q: How safe are carbon fiber helmets? Extremely! Carbon fiber helmets are one of the best options on the market, if not the best. If you’re looking to keep your noggin in one piece, look no further. We recommend these helmets for a variety of reasons. One of those reasons is that they’re lightweight, so they don’t get in the way while you’re trying to ride. The biggest reason, however, is the extra safety measures that they offer. You won’t find another material that can stand up to so many safety tests! Q: Do I really need a helmet at all? Yes. We understand why you would be reluctant to have one. Many people who ride motorcycles think that helmets are an eyesore, or that they’re too experienced to bother with it. The statistics tell a very different story, however. Helmets are around 37% effective in preventing death, and about 67% effective in preventing traumatic brain injuries. Those are some pretty good numbers… especially when dealing with a life or death topic! There’s a reason why so many organizations put out this information and run these studies. Motorcycle safety is no joke. We all know somebody, or know of somebody, who has gotten into an accident while on the road. Crashes are, after all, a pretty common occurrence. Why take the risk of not wearing a helmet? You have a family to go home to, and people who love you. Next time you get on your bike and consider not wearing a helmet you should think about those you could leave behind. We know, it’s pretty morbid, but it’s the cold truth. Q: Where can I buy a carbon fiber helmet? So glad you asked! We’ve provided the top ten helmets currently on the market in this article. You can easily see the pros and cons of each, as well as a description of the best features they offer. We’re sure that after reading this article you’ll be able to find the perfect helmet to suit your purposes. The hard part will be deciding which one you want to buy with so many great options available!